Every once in a while you read a book that hits you hard, beats you down emotionally, or gives you a metaphorical punch in the gut. Barefoot Gen is one of those books. 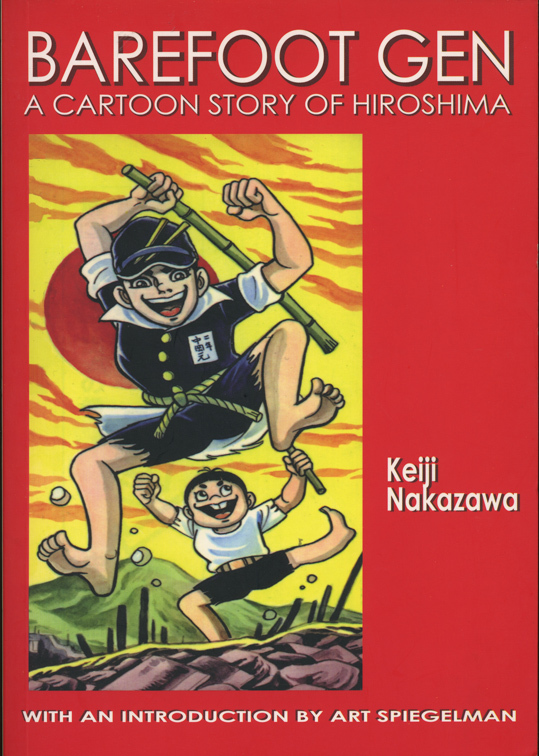 The main character of this moving graphic novel is Gen Nakoaka, but really it’s Keiji Nakazawa, the author of the book. You see, just like Gen (the character), Nakazawa was in Hiroshima, Japan on August 6, 1945 – the day the U.S. dropped an atom bomb. This first volume (out of 10) focuses on the weeks before the bomb, and how Gen’s family is affected by Japan’s war against England and America. His oldest brother enlists in the army, another brother is sent out of the city to work for the government farms, his father and mother are trying their hardest to keep the family together and properly fed, and his sister and younger brother are slowly starving. In front of the Peace Bell in the Hiroshima Peace Park, a group of Japanese 6th graders interviewed me to practice their English and ask me about my thoughts on world peace. I said it was a good idea. The book is a history lesson rolled up into a personal narrative, with funny moments, touching bits, and a whole load of horror. It was especially moving to me, considering the fact that I bought it in the Hiroshima Peace Museum, just a few hundred yards from the spot where the bomb exploded 67 years ago. With the brand new book in my backpack, I strolled through Hiroshima, past the A-Bomb dome (one of the few buildings that survived the blast), the Peace Memorial, and groups of young Japanese school kids practicing their English by interviewing American tourists about their wishes for peace in the world. It was a moving, emotional day. Minooka TAP students in front of Hiroshima’s A-Bomb Dome. We can argue all day about whether or not America should have dropped the bomb, but that’s not the point. It happened and we can’t change it, but we should understand how it impacted regular people. This book humanizes the tragedy in a similar way that the Maus books, Anne Frank, The Book Thief, and Number the Stars gave faces to the Holocaust victims – Gen becomes a face for the tragedy on the other side of the war – an innocent boy, who endures countless horrors through no fault of his own. This is the 29th book I’ve read this summer. I’m shooting for 90 books in 90 days over break, and I’m sure that the next 9 Barefoot Gen books will be among the ones I read this year. With the movie that came out last fall, Tintin has become a popular character here in the U.S., but he’s not new like many people think. In fact, Tintin’s first appearance, in the comic section of a French newspaper, was in 1929. That makes Tintin just a year younger than Mickey Mouse, five years older than Donald Duck, and nine years older than Superman and Bugs Bunny. Just for good measure, that also makes Tintin old enough to be Charlie Brown’s dad (debuted in 1950), and Calvin’s (from Calvin and Hobbes) grandfather (Calving started in 1985). Actually, the animated movie that everyone reading this should see, is the 6th Tintin story to be released as a movie. The other ones aren’t very good, and aren’t in English, so I can’t recommend them. I was first introduced to Tintin almost by mistake. I run a program called Minooka TAP, a group of teachers that takes 8th grade student on summer trips to foreign countries to study history and culture. We prepare each group for almost two years before we actually travel, and a lot of that prep work is done by reading all sorts of stories, poems, articles, and websites to get an much information crammed into our brains as we can. Last year, our group traveled to Spain, Portugal, Gibraltar, and Morocco. We read some books set in each of those countries, but I was having a hard time finding anything set in Morocco. Finally, I found a book called The Adventures of Tintin: The Crab with the Golden Claws. Part of that story took its hero, Tintin, through a marketplace in Morocco as part of a wild chase scene. Since we were going to spend some time in one of those marketplaces (a medina) and the book had some great illustrations of one, I bought it. That day in Morocco was unlike anything I’d ever experienced before, but I felt a little better prepared, because of Tintin. On top of that, it was a fun, action packed story (with a lot of comedy thrown in). I’ve been meaning to read more Tintin books (there are 24 all together) ever since, but I finally found some time to this week. The first one I read, Tintin in America wasn’t great. It was different from the other Tintin book I read, but I couldn’t quite figure out why. Then I realized that a lot of supporting characters that I loved were missing. This was only the third Tintin book, so the author, Herge, hadn’t figured everything out quite yet. On top of that, all the American characters were kind of stereotypes and a little racist. There was a Chicago gangster, a tribe of Native Americans, and an evil businessman. Also, the story felt disconnected, as if a whole bunch of unrelated things kept happening to Tintin and they didn’t fit together. If you like Tintin a lot, I recommend it, because you can catch glimpses of who the character became, but if you’re not a big fan, just skip the early books. Next, I read Cigars of the Pharaoh, which I liked a lot more. It was full of action, and introduced some of the characters like Thomson and Thompson, that became regulars throughout the rest of the series. You can tell that Herge did a lot of research on the settings (India and Egypt) to make the story as realistic as possible. This one is a lot of fun. 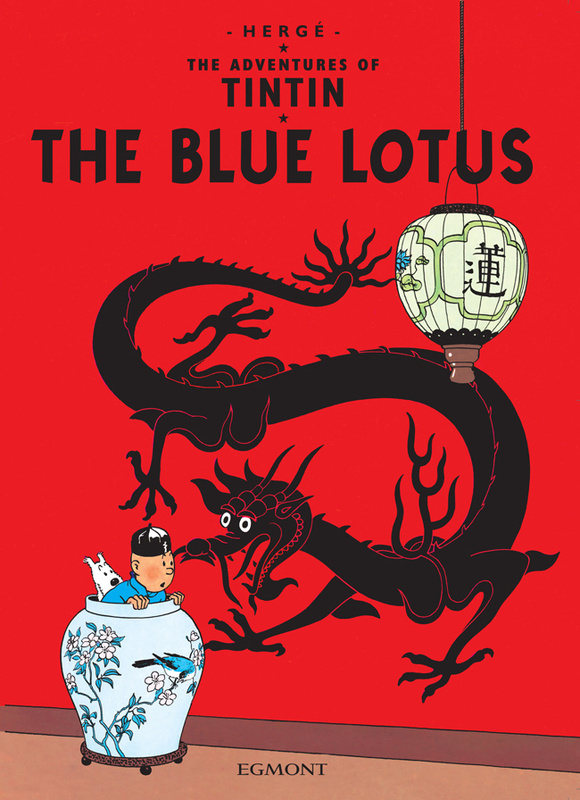 That story continues into The Blue Lotus, which is set during a time right before WWII, when Japan was trying to take control of China. Tintin finds himself in the middle of some political problems between the Japanese and Chinese. Some of the bad guys from Cigars of the Pharaoh carry over into this book too. I really enjoyed most of this book. It’s only 62 pages, but that’s a little to long for the story. I enjoyed the first 50 pages and the last 3 pages a lot. There were about 10 pages there near the end that just didn’t work for me. Overall, thought, it’s well worth reading. I’ve already reserved the next three Tintin books at my local library. These three books put me at 27 books for the summer. I’m trying to read 90 books in the 90 days of vacation. Cartoons left a void in my life when Bill Waterson retired Calvin and Hobbes. Nothing quite worked for me after that. Then I found Amelia Rules, really, Amelia Rules found me, because the author, Jimmy Gownley, visited our school a few years ago. In the weeks leading up to his visit, I read every single Amelia book he’d written. It turned out that Calvin was gone, but I’m pretty sure that Amelia is his daughter. Recently, I found Babymouse by Jennifer L. Holm and Matt Holm. I’m fairly certain that Babymouse is Calvin’s rodent niece or something. She’s fantastic. Now I’ve got my hands on Squish. This book is ridiculous. Ridiculous is good. The main story is great. Squish is a fantastic character, with real middle school problems – except that he’s a single celled organism. He’s dealing with unfair principals, goofy friends, strict teachers, and, of course, the school bully. That’s all well and good, but what makes Squish brilliant is the subtle science lessons kids will get out of reading Squish – I really wish I could convince the science teachers at my school to do a novel study. However, the brilliantest parts (yes, I’m an English teacher, so I’m licensed to make up words like brilliantest) are the little asides – big green arrows that point out funny little observations (my favorite being the arrow pointing at Squish’s bedroom dresser, asking “what’s in there anyway? It’s not like he wears clothes.” – see that’s funny, because he’s an amoeba with a dresser. It’ doubly funny, because it’s not weird that he has a hat, his dad wears a tie, or that he lives in a house, but it’s weird that he has a dresser – that’s brillianterester). Really, one of the best comics/graphic novels in a long, long time. Squish is my 19th book this summer. I’m on a quest to finish 90 books in the 90 days of summer break. There are folks out there that think comic books or graphic novels aren’t “real” books. Smile by Raina Telgemeier is one of the books that will change their minds. It’s got everything you want out of a middle grade level novel. There’s comedy and drama. Laughter and tears. There’s the emotional heartbreak of being a teenager, and the excitement of youth. Family troubles, obnoxious little siblings, too much homework, friends that just don’t understand, and that boy/girl that you like that just doesn’t seem to realize you exist… Raina went through all of that, just like every teenager, but she also had to endure the years and years of dental procedures after knocking out her two front teeth in junior high. Smile is drawn in a friendly cartoonish style that reminds me of Jimmy Gownley (Amelia Rules! ), and written in a friendly tone that feels like it really is 12, 13, 14, and 15 year old Raina telling you her story. She’s a deep character, and she really lets us inside of her thoughts, feelings, and fears, which makes for a fantastic read. The story is pretty much an autobiographical memoir of the author’s life during her middle school and early high school years. What’s amazing to me is how real she gets. Even though it’s her own story, and the character is her (even the same name), she doesn’t pull any punches. She shares the intimate and embarrassing parts of teenage life, so author Raina lets us squirm and wince alongside cartoon Raina. Honest, flawed characters, who we really get to know on a personal level are the best characters in the world – Raina is able to make Raina one of those. Smile is one of the 20 books on this year’s Rebecca Caudill list, so it’s really cool to see such a great book (yes, real book, not just comic) that happens to also be a graphic novel get recognized like this. When Mrs. Sergeant, the school librarian, gives her little speech about the Caudill books this fall, I will definitely be chiming in to recommend Smile to all the kids. As this book explains, World War II began in 1939 when Russian and Germany invaded Poland. A year later, the Germans invaded France. It was no time at all before the Nazis had control over the country, and France was divided in two – occupied France, controlled by Germany, and Vichy France, controlled by a puppet government out of the city of Vichy. Neither was a dream situation, but being in occupied territory was much worse. Soon after the country was under German control, a resistance started up, regular folks organizing together to help restore things to the way they were. Of course, some French people agreed with the German ideas, and betrayed their friends and neighbors. The afterward of the book explains that there’s virtually no written history of the French resistance movement, writing things down would have put the rebels at greater risk. Some of their plans worked, while some failed. Some of the resistance fighters lived, others were captured. All we really know is that thousands of brave people, young and old, men and women, Jews and Christians, fought the Nazis in their own way. This graphic novel (the first in a three part series) tells the story of one small band of resistance fighters. The story focuses on Paul and Marie Tessier (brother and sister about 12 and 9 years old), their Jewish neighbor Henri, their older sister Sylvie, and Sylvie’s love interest Jacques. When their small French village was over run by Germans, Henri’s parents were captured. Henri was relaxing by the pond and missed by the Germans, so Paul and Marie take it upon themselves to hide him from the Nazis. Accidentally, the siblings stumble upon some members of the resistance, who see the benefit to having innocent, unsuspected children working for them. Before they know it, the Tessiers are in the middle of it all. Honestly, this book is really good, because it exposes a part of history that most people aren’t aware of. Most young adult WWII books focus on the Holocaust, DDay, or Pearl Harbor. I’ve don’t remember seeing any other that focus on these types of events. However, on it’s own, the book is pretty unsatisfying. It’s unclear how “real” the story is, if the French resistance actually included young children like Paul and Marie, so it’s hard to 100% buy into it. Also, because there’s two more books in the series, this one leaves you hanging at the end. Don’t get me wrong, I really enjoyed the story – it was exciting and interesting – but I wish I had book 2 sitting here to see what happens. This summer I’m on a quest to read 90 books in 90 days. This was #17.